This dataset represents bathymetry of the Quabbin Reservoir at 10-foot intervals. This dataset represents bathymetry of the Quabbin Reservoir at 10-foot intervals. Both contour lines and polygon features are available and were developed by the Massachusetts Dept. of Conservation & Recreation, Division of Water Supply Protection, Office of Watershed Management. 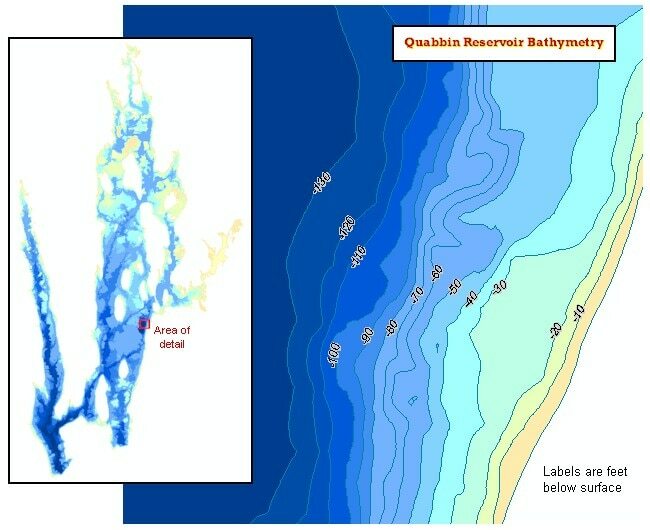 The data were generated from a raster image of a TIN model composed of digitized elevation point data which had been surveyed and mapped in the late 1920s, prior to the formation of Quabbin Reservoir. Supplemental elevation points representative of the current Reservoir shoreline, Winsor Dam and Goodnough Dike were added to improve the resulting TIN model. The nearest neighbor method with a cellsize of 5-meters was used to create this raster image. This data is intended to be an accurate representation of the reservoir bathymetry. However, soil erosion and re-deposition, inaccuracies, typographical errors in the original mapping or other mistakes may exist. Therefore, the accuracy of these data is not intended to permit its use for precise navigation. The contour layer is named QRBATH_ARC. A polygon layer containing depth ranges is named QRBATH_POLY. DCR generated contour lines from the TIN. MassGIS created polygons from the linework coded for depth range. To speed display, the polygons were split into sections, loosely following boundaries in the Orthophoto index layer (OQMAIN_POLY). As a result, when mapping the data MassGIS recommends displaying the polygons with no outline, with the the line layer drawn on top. DCR will maintain the data. No updates are planned.